Remarkable leaders know how to envision a future and bring that future to life. 548™ is a brilliant set of building blocks designed to bring the future you desire for your organization to life. Starting with vision and strategy, 548 provides a comprehensive roadmap towards realizing your future that includes the cultivation of the human spirit. This is a series of individual and collective interviews with senior leadership to pinpoint where you are and what you want to achieve. This step of gaining agreement on the organization's future by its leadership is invaluable. A retreat designed to cultivate cohesiveness within your senior team. Creating a shared vision, establishing rules of engagement and getting to know work styles and preferences all contribute to this cohesiveness. First™ is an invaluable two-day retreat that establishes a solid and long-lasting foundation for your senior team. Think strategic. Create a plan. Bring that plan to life. Focus is the development of your strategic playbook that encourages smart thinking and decisive action. Built through a process of data collection, gut instinct, and insight from your front-line employees and customers, Focus is a dynamic process that will enliven and inspire action. If you are not tired of communicating, you are not communicating enough. All-Hands is a vibrant all employee meeting designed to share your strategic plan in a comprehensive way while engaging the hearts and minds of those tasked with bringing that plan to life. Most importantly, employees will not be surprised by the strategic direction because they played a part in setting it! A mix of media, the All-Hands meeting taps into both parts of our brains – the logical and emotional – so all feel inspired to embark upon the future. Stay focused. Build the muscle to stick to the plan.These monthly accountability check-in sessions are designed to ensure the plan stays on track and act as forums to tackle implementation issues. Your strategic plan may require the adoption of new ways of thinking or new skills. Three developmental Learning Labs™ are offered as part of 548™ to ensure the skill-building of your professional staff. Keep the momentum alive over time. Five, one-hour Learning Shorts™ do just that for your front-line. How long does this process take? A year and a half, or 548 days! Say yes to 548™ and bring your vision to life. Both Evan & I have been teachers and students of Corporate Culture for a very long time. Getting the Culture right is at the heart of unleashing people and organizations to do great things. 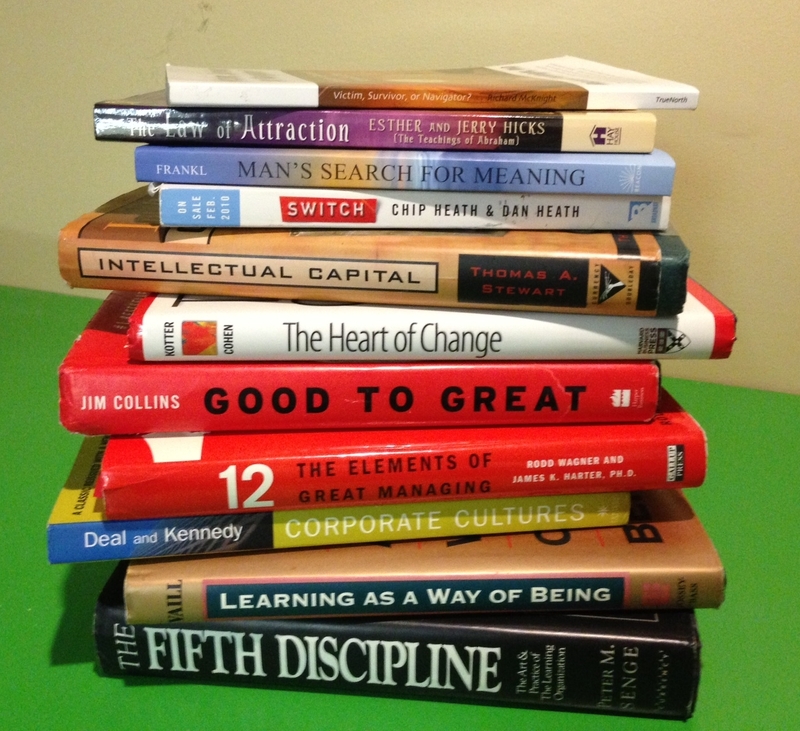 We thought you might enjoy seeing a list of the books that have shaped our ability to effect real, visible change in organizations.